A temporary bridge being used on a bridge replacement project in Canada was installed in just three weeks. 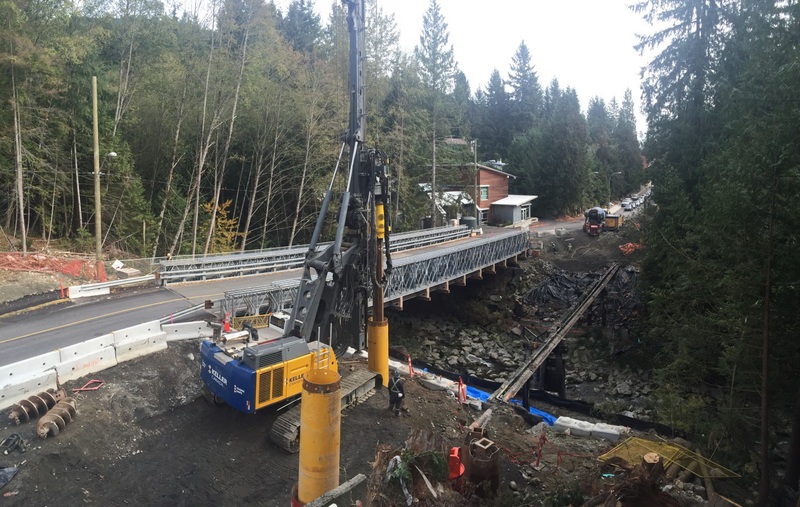 Work to replace the Montroyal Bridge over Mosquito Creek in British Columbia is due to be completed this summer - the project involves use of a temporary diversion bridge which was supplied by Acrow and installed within three weeks. The structure being replaced is a 60-year-old timber bridge which is under-capacity as well as being at the end of its useful life. Because the existing bridge is close to a fire station, it was critical that the detour structure be in place before demolition began in order to provide continuous passage for emergency vehicles. In addition, the route is heavily used by commuters. Launch and erection of the temporary bridge posed numerous challenges. Because no room was available to stage components on site, they were delivered to an area 4km from the site and brought to the work zone as needed. The build area for the detour bridge was limited to 12.2m by 9.75m on the west side, so the bridge was erected on rollers, with additional rollers on top of a temporary launching pier necessary for ease of erection and a safe launch. For the final launch, a large crane positioned on the east side was attached to the east end of the bridge, which was moved to its final position and held 2m above the east bearings while the temporary pier was removed. The bridge was then lowered and set onto the bearings. The owner of the project is the Corporation of the District of North Vancouver, BC. The contractor is Eurovia BC, with design engineers All-Span Engineering & Construction and McElhanney Consulting Services. The design engineer for the owners was WSP Canada. Installation was completed in less than three weeks and the bridge is expected to remain in place throughout the construction, which is scheduled for completion this summer.